Spots can be a devastating development for a teenager; right when a person is about as vulnerable as they will ever be with the worst self image, is right about when they will fight the worst acne of their lives. It’s because of all that chocolate they eat, right? Wrong. Chocolate, pizza, coffee- all of the foods normally associated with causing spots are all part and parcel of the old wives tale. A raging case of the spots can be an all consuming thing, and not surprisingly people of all ages and all walks of life are fairly obsessed with figuring out where it comes from and how to deal with it. Not surprisingly there are endless folk- medicine remedies and theories about just this sort of thing, and not surprisingly again most of them fall under the “old wives tale” category—they sound like they make a lot of sense, but just are not true. Let’s take a look at a few of these foods and why people think they cause spots. The chocolate connection is the biggest, and it is easy to see why. 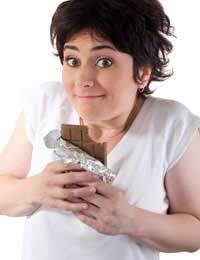 Chocolate is full of sugar, oils, and milk- things that can absolutely cause a reaction to people who are sensitive to such ingredients. The only item found in a chocolate bar that could have a link – tenuous at best—to spots is the caffeine. Obviously linked to coffee as well, caffeine can increase stress levels, which some think can aggravate a person’s condition who is already suffering from spots. When it comes to pizza, chips, or essentially any greasy food, people link the grease in the food to the grease—or oil—in their face. They know that acne comes from oil build up in their pores, which allows bacteria to grow under the skin, so they make the connection between the two oils. As in the case of the chocolate, no scientific link has ever been made between food and a case of the spots. Some people become obsessed with cleanliness when dealing with acne, convinced that it is linked to the condition. Truth be told, having acne does not mean a person is dirty—in fact, excessive cleaning and scrubbing will only serve to irritate the skin, which can inflame acne. Another common practice when dealing with acne is to squeeze, or pop, inflammations in the hopes that it will hurry the condition along and speed recovery. This is, alas, yet another wives tale, and could make the condition worse. The squeezing can push the offending oils and bacteria deeper into the epidermis and wide up prolonging the condition rather than shortening it, and in extreme cases can lead to scarring. No one is happy to wind up with spots, and the obsession with removing them is what lead to all the wives tales in the first place. The best way to deal with spots when you have them is to try a topical treatment designed to help, or consult a dermatologist for a treatment plan. An allergy to milk protein can also lead to spots.